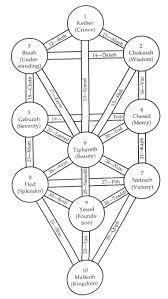 At the core of the ancient system of wisdom, the mystical tradition within the Jewish faith that is known as Kabbalah, is the central symbol, The Tree of Life. While Kabbalah itself is an ancient religion, it is also a science and a philosophy and an art which together reveal the interdependent nature of spirit and matter and the way that existence functions on every level. Its principles, and the underlying wisdom in its understanding, also transcend all religions, all systems of thought and belief. The Tree of Life can be seen on many levels, but perhaps above all as a blueprint of the human being, of our life and consciousness. Its Sephiroth, or its Spheres, are emanations of Divinity: each one is a sphere of light, a receptacle that receives and holds a different potency of the energy that streams down to us from the Divine. While these spheres represent the process of creation, therefore, they also represent archetypes. Each Sephiroth also has its place on the Tree; it relates to all the other spheres in various ways through the paths that connect them, and as the Tree is a blueprint for our lives, each sphere reflects an aspect of what happens inside us on the paths of our human journeys. Just as the spheres in the Tree of Life represent different worlds, or parallel realities, so as we bring about change in our awareness and understanding, letting go of old and worn-out ‘stories’ or versions of the truth, the potential is there for us to step into a different reality: ones of peace and abundance and love, in which our joy and creativity can be expressed. So as we receive more and more of the light that Metatron is offering us, we allow in more of the deepest good in the cosmos.